“Frog leg stew” grumbled Girolomo Tiraboschi as he glanced up into the dome of the cathedral of Parma, where he served as a priest in the late 18th century. Correggio’s Assumption of the Virgin, a vortex of fluttering drapery and naked limbs, rose above him. 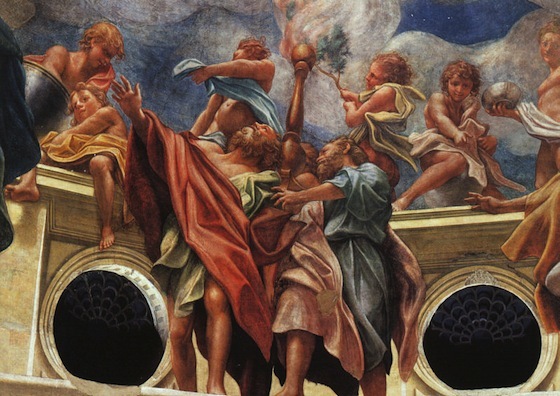 Parma’s leading citizens had commissioned the fresco in 1522, shortly after the papacy liberated the city from the French king’s occupying forces. Crowning Parma’s most important sacred space, the fresco not only illustrates the Virgin Mary’s joyful reunion with her son, it also visualizes key Catholic doctrines, celebrates the city’s return to the Papal States (lands ruled by the Pope), and symbolizes the final union of the faithful with the divine at the end of time. Numerous medieval texts recount the story of Virgin Mary’s final days. According to the popular Golden Legend, the Apostles were miraculously transported to the Virgin’s home at the time of her death. They performed the Last Rites and placed her body in a tomb, only to learn three days later that she, like Christ, had been bodily assumed into heaven. 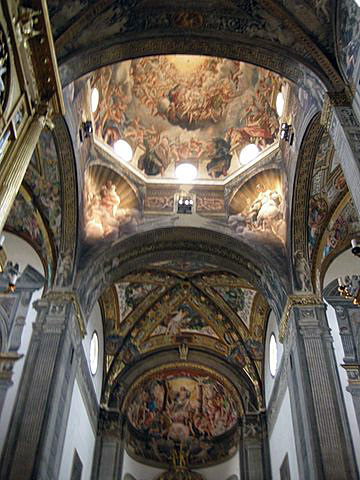 In the cathedral of Parma, the narrative of the Assumption unfolds as the devotee moves from the main entrance, down the central aisle (the nave), toward the main altar located directly below the dome. From the entrance, the nave’s ceiling obstructs the view of the dome. Only St John the Baptist and St. Hilary of Poiters, the patron saints of Parma, are visible in the triangular niches (squinches) that support the dome. St. John embraces the Lamb, symbol of Christ, while St. Hilary gestures with one arm toward the nave and with the other points down to the altar, both directing the viewer to the liturgical focus of the cathedral. Next, the Apostles come into view. These robust figures stand on a ledge executed in striking trompe l’oeil (“deceive the eye”) perspective around the octagonal base of the dome. Some shield their eyes from the brilliance of the divine light; others gesticulate excitedly, their draperies agitated not only by the energy of their gestures but also by the otherworldly force that pulls the Virgin upward. On the low wall behind the Apostles, wingless angels busy themselves with a variety of funerary rituals; some tend to the flames of oil lamps shaped like golden candelabra, others fill censors or burn fragrant branches of cypress. The devotee moves forward to see what so astonishes the Apostles. 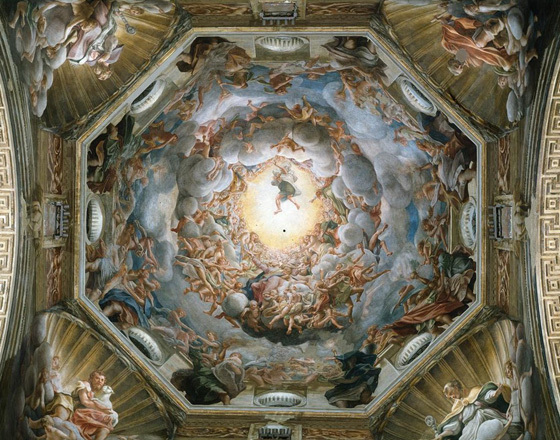 The Virgin Mary appears seated upon a cloud that floats in the space defined by the dome. Frolicking angels, ranging in age from infants to adolescents, populate concentric bands of clouds that extend into the apex of the dome. Mary twists her body and opens her arms as she rises toward the golden light of heaven. Adam and Eve appear on the Virgin’s right and left. Eve extends the apple, a symbol of her disobedience, toward the Virgin Mary; Adam touches his chest as if acknowledging his fault. This view of Mary, framed by Adam and Eve and rising toward the light, was the last seen by the lay viewer. Its message is clear: the Virgin Mary repairs the bond between the human and divine broken by the sinfulness of Adam and Eve. Her obedience to God’s will made her the chosen vessel of the Incarnation and earned her a place by Christ’s side in heaven. 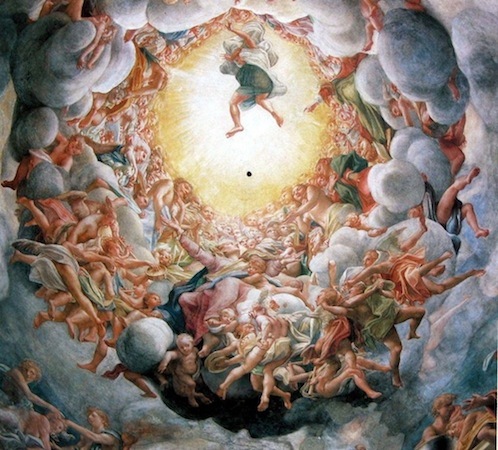 At the time of the fresco’s creation, the faithful received the Eucharist (bread that has been consecrated, or ritually transformed, into the body of Christ, according to the Catholic doctrine of Transubstantiation) at the foot of the staircase leading to the main altar, precisely where Mary appears rising toward the light of heaven. The beardless figure of Christ becomes visible only further up the staircase, in the area reserved for the clergy. Christ hovers directly above the altar where the bread is consecrated. His white garment rises up as he descends to meet his mother, his arms raised in a powerful gesture that opens the heavens and raises the dead. This same divine power also turns the bread on the altar below into his body. When the fresco is viewed from the main altar, directly below the dome’s apex, Tiraboschi’s disparaging comment have some validity. The viewer struggles to sort out the many limbs that hover above in extreme foreshortening, obscuring the narrative’s legibility. The narrative is clearest from the oblique viewpoint of the laity who approached the fresco from the cathedral’s nave. The clergy, who gazed up from the main altar or their seats in the choir, saw primarily the realm of heaven. Correggio’s unusual and seemingly indecorous portrayal of Christ in extreme foreshortening, with his youthful legs exposed, draws attention to Christ’s physicality, and thus both to his Incarnation through the Virgin Mary and his bodily presence in the Eucharist. Painted during the first decade of the Protestant Reformation, Correggio’s fresco visually reaffirmed Catholic doctrines that had come under attack, in particular the doctrines of Transubstantiation, of Mary’s status as intercessor, and of the Church’s role in human redemption. In the sacred architecture of the Roman and Byzantine empires, domes were viewed as symbols of heaven. Correggio merged this symbolism with the Renaissance’s fascination for three-dimensional illusion. He transformed the dome from a solid surface into heaven itself. The dramatic di sotto in su (from below to above) perspective heightens the reality of the illusion. As the first follower of Christ, the Virgin Mary personifies the Church, the community of the believers. 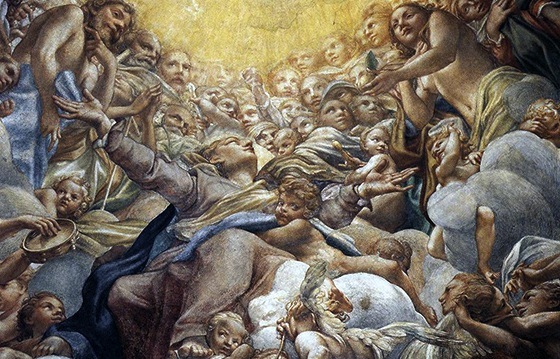 Through the Assumption’s daring foreshortening, Correggio reassured Parma’s citizens of the palpable reality of eternal salvation. Cite this page as: Dr. Esperança Camara, "Correggio, Assumption of the Virgin," in Smarthistory, August 9, 2015, accessed April 20, 2019, https://smarthistory.org/correggio-assumption-of-the-virgin/.